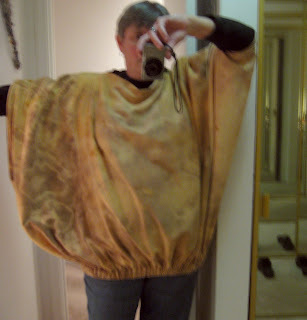 Well, it would have been smarter to dig out the instructions for using the timer on my camera, but recording my transformation into a baked potato for Halloween didn't seem all that SERIOUS. I'm beginning to look spud-like. Last year I made a galaxy skirt from tie-dyed and discharged fabric. This year I've washed and bleached the skirt in very hot water, then turned it upside down. Now I'm working out the bugs for the stuffing, and the neck and wrist openings. My little students will immediately understand my costume. We start most of our directed drawings with a baked potato shape because everyone can draw a baked potato. I'll probably have to rush home after school for a sour cream fix. I've never worn comfort food before!